Here’s a set of two of our Portamate PM-3300 sawhorses (the “T” in PM3300T stands for “Two”). That means you are getting a pair of all steel, heavy duty, rock solid folding sawhorses that will make all of your DIY or professional projects easy. A stable, solid work surface is paramount for good work, and these will provide you that, and when you’re finished, will fold right up for easy storage. 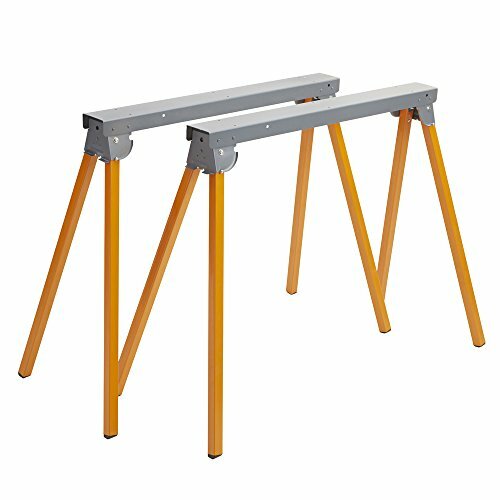 Fully assembled, you can use these sawhorses right out of the box – just unfold the legs, use the locking pin to lock them into place, and that’s it. The quality will be apparent, with one-inch heavy gauge tubular steel legs, and a powder coated, rust-resistant finish. And because this is a pair, you’re getting a 1,000lb weight capacity, so go ahead and do the heavy work – these sawhorses can take it. You can also attach a 2x4 or 2x6 wood top to each one (they are pre-drilled to accept this). Comes complete with a one year limited warranty.